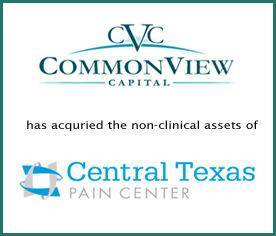 Pain Specialists of America, LLC (PSA) has acquired the nonclinical assets of Central Texas Pain Center (CTPC) and Pain Specialists of Austin, two of the leading comprehensive pain management practices serving patients in central and north Texas. PSA is a portfolio company of CommonView Capital, LLC (CommonView). Provident Healthcare Partners (Provident) served as exclusive financial advisor to CTPC. The terms of the transaction were not disclosed. “Drs. Miller and Frederick have created a market leading interventional pain management practice servicing patients on the I-35 Corridor from Waco to San Antonio that is primed to enter its’ next phase of growth with the support of CommonView and the executive team at the newly formed Pain Specialists of America,” stated Steven Aguiar, Managing Director at Provident. CTPC was founded in 2004 as a small practice with support from McKenna Memorial Hospital. CTPC’s 14 physicians are trained to use medically proven and state of the art treatments for pain. All offices provide a full spectrum of interventional pain management services including epidural injections, facet injections, spinal cord stimulator, radiofrequency ablation, etc. For more information, visit http://centraltexaspaincenter.com/. PSA is a management services organization that provides state-of-the-art, patient-focused support services to comprehensive pain management practices. In addition to purchasing the non-clinical assets of Pain Specialists of Austin and CTPC, PSA also entered into long-term management services agreements with Pain Specialists of Austin and CTPC (collectively, the “PSA Organization”). The PSA Organization provides comprehensive pain management services in Texas through 24 physicians, nurse practitioners and physician assistants from 21 clinic locations and two licensed ambulatory surgery centers. For more information, visit www.painspecialistsofamerica.com. CommonView Capital was founded in 2015 by Scott Budoff and Tom Perlmutter, each with over 25 years of private equity experience, to pool the substantial capital resources of their family offices to make control equity investments in North American lower middle market companies with meaningful barriers to entry that have the potential for rapid growth, both organically and through acquisitions, with a focus on companies in healthcare services and other sectors. For more information, visit https://www.commonviewcapital.com. Provident is the leading investment banking firm specializing in merger and acquisition advisory, strategic planning, and capital formation for middle-market and emerging growth healthcare companies. The firm has a vast network of high-level, senior industry contacts, comprehensive knowledge of market sectors and specialties, and unsurpassed experience and insight into the M&A process. Provident uncovers value and opportunities that others often overlook to create transaction premiums for its clients. For more information, visit www.providenthp.com. ©Securities through PCF Capital Markets, LLC, a registered broker-dealer with the U.S. Securities & Exchange Commission, a member of the Securities Investor Protection Corp & the Financial Industry Regulatory Authority (FINRA) ©2015 Provident Healthcare Partners, LLC.